By happenstance I came across a fascinating 1979 Atlantic article by James Fallows — Carter’s speechwriter for two years — on exactly this topic. Titled The Passionless Presidency, it contains a remarkable number of observations relevant to engineering management — and leadership — today. Peter Drucker wrote at length about effectiveness — how can a manager actually makes an impact. Fallows makes the same point — and why Carter failed. The third [gift Carter lacked], and most important, is the passion to convert himself from a good man into an effective one, to learn how to do the job. Carter often seemed more concerned with taking the correct position than with learning how to turn that position into results. He seethed with frustration when plans were rejected, but felt no compulsion to do better next time. …to give Cabinet secretaries free rein….The book [Carter read] —and the policy—were wrong because they omitted the necessary caveat: if a President wants to allow Cabinet secretaries full day-to-day control, he must make special, almost daily efforts to find out how that control is being used. Once they [Carter and his staff] had the right answer, they thought their work would be done. Carter never checked in, never evaluated the output of the people working for him, and as result he wasn’t effective. …he never really practiced a speech—not in the sense of subjecting his performance to the scrutiny of others and letting them say plainly how he must change. He did not need to search constantly for people to push and test him, because his unpushed abilities were good enough…this characteristic could be called complacency. Of all that challenges me in management, having the discipline to focus on the longer term is one of the biggest. In technical management, credibility is often rooted in technical knowledge, but once in management you often don’t have the time to understand every single detail. They [Carter and his top staff] fell prey to predictable dangers and squandered precious time. 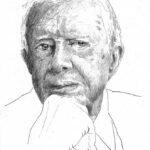 If [Carter] is distracted from the big choices by the torrent of petty details, the big choices will not get made—or will be resolved by their own internal logic, not by the wishes of those who have been elected to lead. [Carter] would pore over budget tables to check the arithmetic, and, during his first six months in office, would personally review all requests to use the White House tennis court. Something to consider when you next think you may be micromanaging your team — are you just checking the tennis courts? The longer I am in management, the more I appreciate the importance of vision. It’s one of the key ways you scale, since a clearly communicated vision helps decentralize decision making, allowing your team to make choices aligned with the team’s larger goals. [Carter lacked] the ability to explain his goals and thereby to offer an object for loyalty larger than himself. …it showed that Carter’s inner values mattered less than his naïveté about organizations and the effect of symbolic acts. But no one could carry out the Carter program, because Carter has resisted providing the overall guidelines that might explain what his program is. He thinks he “leads” by choosing the correct policy; but he fails to project a vision larger than the problem he is tackling at the moment. This last point seems critical to me — and something that should never be forgotten. During day-to-day management it’s easy to lose sight of the bigger picture. Paradoxically, as your knowledge of your own engineering systems deepen, you lose your ability to step back, start again, and create a new vision for your team. [Carter assumed] people would perform their assigned functions and seek no orders; orders, once given, would be carried out. Programmers, who become managers, can fall into this trap. So used to dealing with computers, they forget that people — even the best programmers — are not themselves computers. They need coaching, direction, and guidance. Later, Carter came to understand that strict deadlines, while occasionally useful for prodding the bureaucracy, could also be destructive, in that they might force him to go ahead with half-baked ideas. This is subtle point — and one that requires the most judgement. When to push people? And when to accept that more time is required? When he moved toward the more usual presidential course—letting his aides worry about the details, and acting on their advice—he neglected the usual corollary, which is that the aide should live or die on the quality of his judgment. The more management you do, the more it’s about the people you hire. And at Carter’s level it was all about the people he hired. Of course, we must keep all of this in perspective. Jimmy Carter reached the very highest levels of American politics — he was clearly someone of superior ability. But in the end it seems ineffective management — not war, not a crisis, not inflation — rendered him a one-term president.